Hearing aid technology has changed drastically over the years- they are now discreet, comfortable, and smarter than ever. Although there are a variety of hearing aids on the market, not all styles are suitable for everyone. Hearing loss is a personal experience, and is unique to you. There are many factors to consider when prescribing a hearing aid, and a personalized treatment plan is necessary for success. Once we have discussed all of your needs, you will receive a prescription for the hearing aids best suited for your hearing loss, lifestyle, and budget. This will include the style of hearing aid, and accessories. We recommend bringing a loved one to the appointment with you. They can provide their own accounts of your day-to-day communication, and provide support during the appointment. Hearing loss not only has an impact on the individual, but also on their family members and those around them. By improving your hearing you can continue participating in the activities you enjoy, minimizing the impact of hearing loss on you and your loved ones, ultimately leading to a life that is richer and healthier. 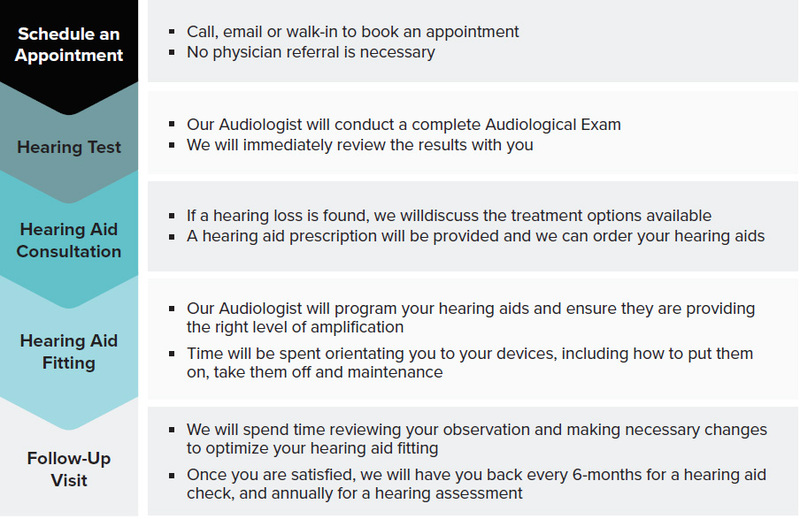 At Port Credit Audiology & Hearing Aid Clinic, we are here to support you every step of the way. Here is a closer look at out Program of Care.